Previous years saw the development of several standardized systems intended to function as thermal / solar cooling kits in connection with different thermal energy sources (solar, biomass, waste heat generated by combined heat and power stations, process heat, local or district heat). The development of these products focused mainly on simplifying and standardizing the system technology and reducing the costs of the cooling kits. All cooling kits are made up of the sorption chiller, the re-cooler, the set of pumps, and the system regulator. The cooling kits can also be supplemented by the solar packages (solar panels including accessories, hot water tanks), cold accumulator packages, cold distribution packages, etc. It is vital for the development of a standardized cooling kit that only one system regulator be used for the overall system. For instance, previous demonstration and pilot projects of solar cooling systems used to always be equipped with several individual regulators to control the solar plant, the chiller, the re-cooler as well as the cooling and heat distribution. However, such systems proved to be costly and showed that the individual regulators did not always work together in the best possible way. 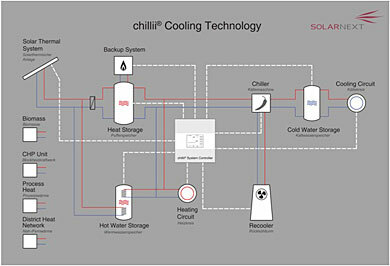 The illustration below shows a sample system layout of commercially available thermal/solar cooling kits.